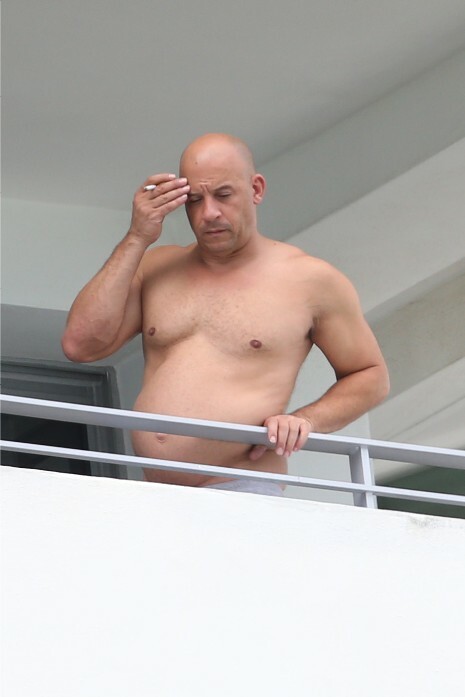 It’s comforting to see that Vin Diesel,48, lets himself go somewhat between action movies. His privacy was compromised when he walked out on the balcony of his Miami hotel and took his shirt off. It takes WORK to maintain that Fast & Furious physique. We remember the late 80’s – early 90’s when Vin was a doorman at various New York clubs – he was playfully charming and he had that DEEP voice that made people pay attention. Good grief, smoking and gained about 50 pounds. By Who says men can't get pregnant? Oh dear, when is it due? I’ve never understood this guy’s appeal. He’s not at all attractive and his voice sounds creepy to me. Is Vin DIESEL in the gasoline business? He is so very strange; is he still a movie Star? he indeed has some gravity problems. He probably walked out on the balcony for a quick smoke and to pass some gas. Fritz Meulders – thanks for the chuckle!